Enjoy the best in custom printed cups, mugs, napkins and more at Drinkware Company, Inc. We carry a personalized selection of high quality drinkware products that will add true value to your next promotional or party affair. Lowest Price Guarantee — We have the lowest price in the industry. If you can find it cheaper somewhere else, we will match that price; that is our guarantee. 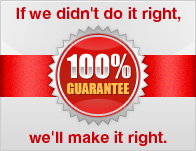 100% Satisfaction Guarantee — If you are not satisfied, then we will make it right. Free Shipping — The only company in the industry offering free UPS ground shipping on all our products with no minimum purchase required. * Some items require a minimum quantity purchase. Customer Care — We pride ourselves in recruiting veteran account managers and guarantee that everyone you talk to is located in the United States. Free Graphic Design Services — Absolutely no one else in the industry offers this service free of charge. The average cost of design services is $50 per hour. This is limited time offer. Free PDF Proof — To ensure you are 100% satisfied with your artwork or graphic design, we will send you an email of fax proof of your design prior to going into production. Exact Reorder Discount — When you reorder the exact same product with the same imprint within a year, we remove the step-up charge from your price. Rush Orders — Need your drinkware in a hurry? We will work with you to ensure that you will receive your products when you need them. Brighten up your next promotion or party with personalized cups and other printed décor from Drinkware Company. Customize your products with the text or logo of your choice, or use our free graphic design service to create something utterly original. Our talented graphic artists are happy to help you make your wedding, business conference, or other event unforgettable. Don’t forget to take advantage of our free shipping and exceptional customer service. Please feel free to explore our site and browse our extensive selection of high-quality custom drinkware, napkins, plates, utensils and more. We’ve only got one planet (last we checked), and we’re committed to protecting it. For that reason, we make it a priority to provide personalized drinkware and tableware that helps preserve the earth’s resources without sacrificing visual quality. When you choose Drinkware Company, it’s easy to get coffee mugs or plastic glasses customized with your business logo or wedding photo while still being environmentally responsible. Acrylic custom mugs and stainless steel tumblers are an excellent reusable option for those looking to save money and reduce the size of landfills. Many of our products are recyclable, including both paper and plastic plates and imprinted sleeves for promotional coffee cups. Biodegradable tableware (such as our printed beverage coasters and full color napkins) helps to conserve energy and prevent pollution. We also carry customized drinkware made from polylactic acid (PLA), an entirely natural corn-based resin. These greenware cups are compostable, biodegradable, and 100% renewable. 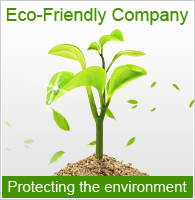 Explore our large selection of eco-friendly products, and rest easy knowing that your special event will be both visually appealing and safe for the environment. With America’s job market and economy on the rebound, it’s crucial to support local businesses and suppliers as much as possible. America also tends to have better labor and product safety standards, so it only makes sense to place greater preference on US products. Our collection of promotional drinkware includes an assortment of products that are custom made in the USA. With our bulk discount and low minimum quantity, it’s easy to buy an inexpensive personalized stadium cup with lids and disposable straws, all manufactured domestically. No matter what type of party you’re planning, customization allows you to add your own unique, personal touch. A personalized glass or acrylic mug is perfect for a promotion or giveaway, and a monogram imprinted on a paper napkin gives a party a truly memorable accent. Now you can stand out in a patriotic way too, by choosing an aesthetically pleasing cup, plate, beer coaster, or other product that’s created in the US. When you buy American made products from Drinkware Company, you can be confident that you’re doing your part to help get our country back on track.